Ep #17: Mindset Vol. 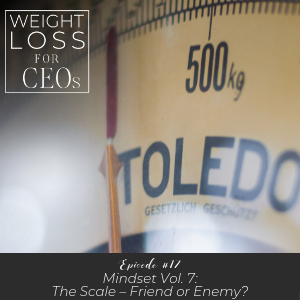 7: The Scale – Friend or Enemy? When it comes time to weigh yourself, do you try anything to avoid stepping on the scale and seeing the numbers that come up? Maybe you don’t even have a scale in your home because checking your progress in this way in the past has made you feel poorly? Well, you are not alone. I have a specific weigh-in day every week, and for a long time, when I stood on the scale and waited for the number to show up, all sorts of negativity went through my mind. The scale had gone from being a useful weight-loss tool to being something I genuinely feared looking at. Join me this week to discover how you can take your power back and up-level how you use the scale in your weight-loss goals. We’re going to work on neutralizing the results you get and how to combine your results with other tools to make losing weight and keeping it off a reality for you. Download my cheat sheet filled with questions to encourage your brain into a more neutral space around stepping onto the scale. How we convince ourselves not to get on the scale. Why the number on the scale is just a neutral circumstance. How ignoring the scale is not helping you lose weight. What you can ask yourself if the scale does present some emotional turmoil for you. How to use the scale as the assisting weight-loss tool that it should be. What is it about the scale? In today’s episode, I’m going to help you to get your power back and up-level your use of the scale, and help you to use the scale for the use it was intended; to give you a measurement of your weight, and that’s it. Yes, the scale was not created to be mean, to shame you, or cause you harm. Your thoughts about what happens on the scale are usually not very neutral for many of us. But, with a little thought work today and moving forward, you can create a neutral space around the scale. Alright, I noticed something this year; I wasn’t weighing in. It was my regular practice for so many years to have a quick weigh-in on Tuesday mornings. I had noticed that some of my vacation shorts were a little snug this past Christmas. Could that be it? I listened to what was going on in my mind this past week and decided to get real and get back on the scale. What was delaying this weight-loss wellness coach’s weigh-in? And I’ll tell you, it was all these thoughts. “Well, you’re a weight-loss coach. You can’t tell them that you’ve gained weight. It’s going to be terrible, you have so much work to do.” Another one, “You know you’ve probably put on like 10 pounds, don’t do it.” And the last one I think is what slowed me down the most, which is very fascinating. This was the thought, “Just focus on the hunger scale and eating lean and green, and then weigh yourself.” This is the choice that I actually feel has gotten me into trouble, by not weighing in and checking in on what’s going on. I’ve gotten all in my head about these three or four stupid pounds and I’m not having it any longer. So much drama, my friends, and so much unnecessary angst. My old crappy thoughts gladly chimed in when I was feeling a little reticent about getting on the scale. You want the good news? It was so much better than I thought. Bad news – there really is none. I weighed a number. It’s three more pounds than my normal top weight, and I feel about that off in my body. That made a lot of sense to me. But my brain was trying to convince me it was an absolute tragedy. Not true – and I want to point something out. The good news was a thought as well. It only felt like good news because my brain was trying to convince me that I had gained a lot of weight. So, even though this area of my life has experienced an entire transformation for real, I have total peace and confidence around food and exercise. I’m no longer yo-yoing in weight, going up 35 pounds and down another 35. I really nipped that cycle in my life, but I’m still human, and so are you. So let’s figure out, in this episode, how to use the scale to our advantage and dial down that emotional drama that we may have around it. First, we’ll handle the mindset piece of this issue, and then discuss how to use the scale as a tool during weight-loss. And I’m going to close with my recommendation and plans to implement scale neutrality in your own life and weight-loss journey, if you’re on one. And even if you’re maintaining your weight, this can be powerful work. Alright, mindset here is really everything. The number on the scale is neutral. And let me illustrate very clearly that this is true. The scenario is this; two women get on the scale and the number is 150 pounds. That is a circumstance in that thought model that I share with you so often; 150, it’s a fact. And for illustration purposes, we’re going to say that both of these women would still like to lose more weight. Woman A is extremely elated. In fact, she’s crying happy tears and she’s ready to pop open the champagne. But woman B shrugs her shoulders and looks utterly defeated. Listen, the scale number was the same. Why did they react so differently? Again, because of their thinking. Woman A just hit 100 pounds of weight-loss and she’s thrilled that she finally reached this amount of weight-loss after a year of eating healthy. She’s had her ups and downs, but this was a great day because of her thought. Woman B, she just came back from a cruise and she put on five pounds. She’s demoralized because she promised herself that she wouldn’t put on weight again, but she knows she felt really out of control during the trip and she’s now embarrassed that she gained the weight. All thoughts – those weigh ins for both of those women, no matter what was going on for them, was all around their judgment that it was good or that it was bad. The only difference in these reactions was their thinking. The only reason that weighing in can be difficult for you is because of your thinking and your judgment towards yourself. And if you’re skipping out on the feedback the scale can give you during a weight loss journey, it will be difficult to attain and realize your goal. It is one of the tools that will help you to realize and create consistent results along the way. I promise you this; it is worth doing the mindset work so you can get to the business of lasting weight-loss. And, if the way you’re thinking is causing you any shame, disappointment, or discouragement, it isn’t helping you one dang bit. You are not defined in your worthiness by the number on the scale. But most of us that work hard at dieting and have really been frustrated by this would absolutely think so. We have also culturally accepted that the scale is a bad thing. I mean, have you seen – there’s tons of graphics around the scale all the time, especially during New Years. And we also need to realize that most of the drama is a set of unintentional thoughts that crop up or get triggered when we get on that scale. Remember, that even happened for me, and I’m just not really that upset about it. Alright, let’s start turning that around today. Remember, I was that Weight Watchers member when I lost weight for the very last time, that I dug in and decided to go to Weight Watchers meetings for exactly another year so that I could learn to maintain my weight. And that’s when I got to the bottom of how the scale truly affected me. One of the lessons that I learned after I had a vacation – I was feeling a little puffy, I knew I’d gained some went, and I literally went kicking and screaming to my weigh in; one of the first times that it was a little difficult to weigh in after I’d lost the weight. And I had gained 1.2 pounds. I was flabbergasted. Because you know what I was thinking the entire way to that Weight Watchers weigh in? Yep, you failed. You can’t do it. You’re doing it again. You’re just going to put the weight right back on. See, it doesn’t work. And mostly, you don’t work. It was all that self-judgment, failure. In that moment, after the weigh in, I literally realized that this was the turning point in my old pattern. The old me would, literally in that moment, give up because of a little puffiness and small weight gain after a vacation or a party weekend or whatever it was; seriously, only 1.2 pounds and a little puff on my stomach. What if I’d weighed myself those previous days and found out it was only a pound and not the failure notification that my brain was offering me? If there is any regret I have in my life, seriously, it was that; not realizing how I turned from eating well and losing weight because of those moments when I thought all was lost because of just a little bit of weight gain. Wow. Now, what to do if the scale is uncomfortable for you or you notice that you’re not on your game so much with eating well, you’re not feeling as well emotionally after you weigh in. Start with these questions to get the thoughts into an objective space, not in your mind. Remember, when we think about what we’re thinking – let me repeat that – when you think about what you’re thinking instead of just thinking it and operating out of that thought, you won’t respond or feel the emotions so strongly. And you can find these questions in the show notes. I will have a quick worksheet. It’s just a cheat sheet with all the questions so that you can keep them as journal prompts. And the show note address is dianamurphycoaching.com/ceo17. Alright, so these questions are really important. You can choose one or a few of them, but right now, I would even go through all of them and think about, like, just let your brain offer you and show you what it is thinking in those moments that it’s making you feel so bad. You can even, after I ask the questions, stop the podcast and write down, if you’re in a position to do so. Alright, what are you feeling about getting on the scale before you even get there? What are your thoughts? What are you feeling? What did you feel waiting for the number to pop up? I always know this is really the longest three seconds, when the scale is about to pop up. I really, usually in that moment, I’ll be honest, I’m hoping it’s a certain number. What are you hoping is the number? It’s important. It sets us up for disappointment if we’re always hoping it’s a weight loss, instead of just getting curious and noticing what it is. But I’ll get to the mind work later. Now, what are you thinking about you? What are you thinking about your success losing weight? What’s coming up in your mind? And then, after you’ve weighed in, how do you feel about the actual number? What are you making this number mean? And I know I’ve offered a lot of questions in this, and that’s, again, why I offer the worksheet if you want to dig in. But if you just would notice how are you feeling about the scale, about the weigh in, the whole process, and what are you making this number mean? Those two questions can give you a lot of insight. You’re going to hear all sorts of thoughts. And they aren’t true. They’re just thoughts. Remember, every thought that makes us feel cruddy is a lie. Write it all down. And if scale moments are a very big deal for you right now, this activity done every single time you weigh in is imperative. It will be uncomfortable, but so productive in getting a snapshot of what your sneaky and mostly negative brain – sorry, that’s just how it works – is doing at the time. Our problem can be expectation. It can be judgment that the diet is not working or we’re not working hard enough. It can come from so many spaces. I literally have heard them all. When you take time to also see the fact that these emotions are having on you afterward, then you’re going to feel more strongly about how important it is to let those thoughts go. Remember, it’s an option to think something every single time. Remember, when you feel like a failure or discouraged or disappointment, most likely, you’re pulling away from great self-care. It can be creating literally a bunch of little give-up moments, that when we eradicate them, this process of losing weight becomes more fluid. It’s powerful. Do give this some thought and dig in if you find your weigh ins to be either nonexistent or distracting you from your efforts. Another fun exercise that I’ve done with clients before is at every weigh in, especially if they’re tripping you up, you hate weighing in, this would be for you. I would have my clients tell me the number and how they felt. What was the emotion? Then, they didn’t know what I was going to do the first time, but I did this over and over. What was so fascinating is it worked. It turned their entire self-esteem around linking that definition of their worth to the scale. That isn’t who you are, my friends. You are not that number on the scale. You are a beautiful human being and that is just tissue on your body. Definitely think about having a friend do this with you. If scale is your enemy right now, this might be a good time to consider working at this with a friend. Doing the thought work will neutralize the thoughts and put the scale in its proper place as a tool in maintaining and losing weight. So what is an empowering way to use the scale? Ask better questions. Gather great information on how your week went. Look at the fuel. Look at overeating moments. Tweak, what can you do next week, and take action again. Now, I’m a realist here. I know that there are many things that affect our weight or your weight outside of the fuel that you eat and the attention that you’re paying to your appetite; hormones, water retention, muscle changes, inflammation, response to medications just to name a few. But by weighing in regularly, using that information as feedback with the other great steps you’re taking, you can take responsibility for your body, your weight, and your health. These circumstances of medications and hormones are just circumstances and we have got to stop blaming them, so we can get to what is working for us and keep doing that. I see the weight on the scale as this definition. That number on the scale is the weight of all the bones and tissue and muscle in your body. How’s that for neutral? Also, it is the way that you’re taking care of yourself now. The way that you’re taking care of yourself now creates that particular weight on your body. If you’re maintaining a particular weight for some time, the culmination of all the ways you take care of yourself creates that weight for you. That’s it. if you want a different weight, you will need to eat less food, eat more of the right food, and move in a way that your body metabolizes that food well. But it’s never as big a change as our brain offers; remember that. And when you start tweaking and changing how you eat and how you drink and how you move, that creates a different result. If you’re learning to stop overeating and learning what is fuel for you, you need feedback. You need to know what is working and what’s not. You will not learn this in a vacuum or by trusting how you feel in your clothes, thus the power of a weekly weigh in. This is how you use the information. This step is the magic. This process that I’m going to share with you points your brain to a space where you really can build some beautiful momentum where losing weight becomes a fluid and peaceful process. If weighing in is difficult for you, it causes a lot of drama, as I call it, do start with the mindset work mentioned above. This will be in the show notes, as I mentioned, dianamurphycoaching.com/ceo17, with a quick worksheet for you. But as you do that work, if you’re working on losing weight, start using the scale in this way. One, note your weigh-in your food journal on your weigh in day. Pick a day that is your weigh in day. It doesn’t matter what it is. Look at the way you ate, drank, and moved last week. Does this result make sense? Next, what is your ballpark guess at the percentage of fuel you ate this past week? And what is one area where you’re overeating? Good questions, right? So if you’re disappointed – for clients that were disappointed in a weigh in result, and that became part of our coaching conversation, when we get to this question, it is so powerful. And this is the question. I would ask them very calmly to look at the way that they ate and drank and moved last week and does that weigh in make sense? And most times, they said yes. And not in a shameful way, but yeah, it does make sense that happened and that happened. It is in that moment that you can decide if you’re going to continue wishing you can lose weight versus taking responsibility. But do you see how calm and lack of judgment it is? It’s more scientific, as I say. Does the way that your week went – does that make sense that it showed that way on the scale? Yes. Not like, did you succeed or did you fail, you know. It’s really interesting to just point your brain in a different direction. And when things aren’t going your way, it is confusing. You can take the time here to tweak and readjust. And this is the journey of lasting weight-loss, learning what foods work well, what substances trigger you, what aren’t fuel for you? You know, when you’re eating foods that are a trigger or are not fuel for you, it can pop weight on really quickly. And that’s why the weigh-in is so important if you’re eating something new in a regular fashion. This is part of fuel testing. That will give you information that that food is not fuel for you. And when you look at everything, what activities help you to drop weight, what fuel does, what triggers are there, this gives you all the information and the scale is just a way to look at it each week. Now, what if you love the result? This is just as important; to look back at the fuel foods you ate, note them, keep noting what is your fuel and notice all the anchors that created that result. And now, rinse and repeat, for real. Learn what works and just leverage that. As you get closer to your ideal weight, you may have to tweak some things; eating more vegetables, filling up on those, thinking about some strength training. Building a little more muscle can really rev up your metabolism. You know, I’m at a point in my life that I really only workout three days a week, and I just make sure one of those is weightlifting, and it’s just changed everything. My body’s in a really good space of having a pretty healthy appetite and feeling really good. You can do any of these along the way, but as you get to your ideal weight, instead of getting discouraged when the scale isn’t moving, it’s so important to see what might be needing some small adjustment. Alright, then I ask that next question, what is your ballpark guess at the percentage of fuel you ate this past week? Now, for example, if a client tells me that it’s like 75%, I ask them to identify one meal or one small habit that would increase the fuel eating – if you looked at the overall way of habits and repeat meals – what would increase your fuel percentage to 80%; tweak, not massive shifts in behavior? You know, when I taught this way of losing weight, 90% fuel eating and 10% joy was the way that I taught it. But you know what I noticed? Even my eating, I would say, on a really great week, is 85%. But 75%-80% with really healthy workouts pretty much works for me. And when I want to lose some weight, I tweak it a little tighter. And when I’m maintaining, I just really watch my hunger scale and focus on fuel. But what I want to point out here is if you can look at your overall percentage and know that a small, small change brings really massive results from that small tweak in behavior, I want you to be really trusting that. It really is cool how that works. Now, it’s always about evaluating. What is working first? What isn’t? And then, what can you do next week? So one other sneaky question I ask when my clients are – even when they’ve had a good week – because again, this is a lifelong journey. What is one area where you’re overeating? Just stop and think about that. What is one area that you’re overeating? And then the conversation might be, what’s going on for you there? What are you feeling? What are some of the thoughts? And we might do some thought work together if it’s a client conversation and just really learn what trigger thought was going on – loneliness at night, other things – and we’ll come up with some great ways to not replace that behavior, but what’s really interesting is if we’re overeating to feel better, we can just learn some beautiful ways to feel better instead and allow those emotions to pass and eat in the way we really intend. So again, when you’re looking at your week and note your weigh-in your food journal, ask this question; does this result make sense? What is my ballpark guess on the percentage of fuel I ate? And what is one area that you might be overeating? And just again, a little bit like a scientist with a lot of compassion and curiosity, where is another place you can tweak if needed? Does this seem so too easy? Yeah, sometimes our history of not being able to keep weight off or being in a position that we’ve never had to lose weight – I work with clients like that. They’ve never gained weight before and they don’t know what to do. It makes us all so emotional and confusing when the scale is not going in the way we intend. What is so powerful is that the tweaks both in mindset and in our eating create amazing results. Just my getting real with the scale this week I know has served me. First, it gave me a lot more clarity in bringing you this podcast. Then I also sensed a shift in feeling a lot more empowered and committed to honoring what my body was asking for in terms of fuel and exercise this past week. I have really been at high energy and sleeping really well. So good to note – it’s not all about weight-loss. When we take really good care of ourselves, we can certainly create weight-loss if needed, but it also is a beautiful way to take care of that amazing body we’ve been given. Thanks so much for listening today and stay tuned as I close out the mindset around weight-loss series. I’ve got something special for you as I round out into my first year doing the podcast. I have so much I want to teach you. Please be sure to share Weight Loss for CEOs with your friends. I’m calling it the best self-care tool for business owners and leaders. It means so much that you’re listening, but please don’t keep it a secret. My goal this year is to reach more and more business leaders this year. If you have some ideas, please share it. Thanks again and have a great week.